A DIRECTOR OF the Irish Blood Transfusion Service abruptly ended a radio interview this morning when he was questioned on the timing of the release of information on a case of Hepatitis B in Ireland. IBTS yesterday announced that a patient had been infected with the Hepatitis B virus from a blood transfusion. 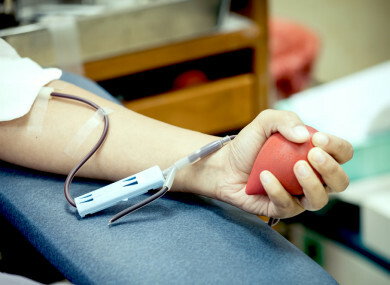 The service said the blood donation was made in the window period where the presence of the virus cannot be consistently detected, even by the most sensitive tests available. It went on to say that this is a rare, one-in-two million event and does not have any implications for blood to be transfused to patients in the future. Speaking to KFM earlier today, Dr Stephen Field, medical and scientific director of the IBTS, said that the service was made aware of the case back in January. “We needed to investigate it fully and get all our facts. It has taken a long time and it also involved a look back on all of the other donations the recipient received,” Field said. When questioned on the reasons why this information wasn’t made public sooner, Field declined to comment and hung up the phone. “We just didn’t [go public sooner than 11am yesterday], that was it,” Field said. Look, I’m not prepared to answer these questions any further. Thank you very much, goodbye. Before hanging up, Field said that the case was reported to the regulator in the early months of this year and that the clinicians who transfused the patient were informed of the infection “very quickly”. “Dr Stephen Field had, during the course of an extensive interview, dealt comprehensively with the complex nature of this case while at all times protecting the identity of the donor. “This included the question regarding the timing of the announcement of a confirmed transmission of Hepatitis B by blood transfusion. He reiterated the extensive nature of the investigation carried out by the IBTS, including the assistance provided by experts in the UK. The service yesterday said 1.2 million donations have been tested and there has been no other confirmed transfusion transmitted infection of Hepatitis B. Hepatitis B virus is a common infection of the liver. It’s transmitted through exposure to Hepatitis B infected blood and body fluids. The infection occurred when a blood donation was taken and the red cells were transfused to a patient, as is the standard medical procedure. In this instance, the donation was tested through molecular screenings, and it was shown to be negative for viral markers, including Hepatitis B. However, the donor was found to have acute Hepatitis B infection. The archived sample of the donation again tested negative. However, an additional test for Hepatitis B virus DNA tested positive. Field confirmed that the patient has fully recovered from Hepatitis B, but was not in a position to make further comments on his health status. Email “IBTS director hangs up phone after radio presenter asks about Hepatitis B case”. Feedback on “IBTS director hangs up phone after radio presenter asks about Hepatitis B case”.